Just because nobody is showing much of anything on the forum these days thought I would show what I just got myself hooked on. All these cute little houses on pinterest! They make nice holiday scenes; don't know what I'll do with all of them. I must say they have improved my ability to PNC by leaps and bounds! Very nice! For some reason I sometime get hooked on making boxes of all kinds. I have to drag myself away from box making to come back to the real world. Your little houses look like they are much more difficult to make than boxes! Are those all cut files you purchased? How long does it take you (roughly) to put one together? I have a friend going through cancer treatment that adores anything vintage. This would be a wonderful way for her to pass some time! Thank you for sharing! @nittany1994 Well no I saved pictures from pinterest, then pixel traced them into MTC. The simple ones go together really fast, maybe 5 minutes? or less. The ones with lots of pieces might take a half hour. Guessing... I've gotten much faster as I learned to "read" the patterns. Probably took me a lot longer to clean up the files then it did to cut and glue the pieces together. I would be happy to send you all my MTC files if I could figure out a way to do that; I think I've made over 50 of them now! These are so cute! Great display! @Rosie0530 The "great" display was on my one little working table so they were there only for the photo. Now they are all over the fireplace mantle and on top of a cake plate on entertainment center; the rest are scattered all over our office waiting for the new shelves to arrive. See what an addition to paper will do for one's organization LOL. @Charo Those houses are so cute!!! What has happened to everyone on this forum? I have been gone awhile myself, but a lot of people have disappeared. Also, I noticed the webinars stopped. Why did they stop? , , , but a lot of people have disappeared. Also, I noticed the webinars stopped. Why did they stop? @Meow Like anything - people come and people go - once Andy quit updating MTC and PCS several years ago now and quit putting out plugins for new machines - you start to see less and less people coming into the forum. As that occurred, people moved on to other things and quit sharing their projects and such here - that leads to losing even more people leaving and moving on to other things - after a while, you just get us die hards who cannot imagine not checking in on the MTC forum, and others who drop in occasionally. The Webinars stopped originally to take a break for a month - then it was the summer. The general consensus of the powers in charge at that time I believe was that without new updates and changes - pretty much anything and everything within MTC and PCS would have been covered multiple times in the years and years worth of Webinar videos that were already available. As far as what happened to Andy and Bryan (I saw where you asked that on another thread) - Andy has a growing family he had to provide support for - last anyone had sorted out - he got a "real job" and seemed to loose his desire for these programs and/or had no time with his family and a real job. Nobody knows for sure because nothing has ever been "officially" said here. Bryan is still around (At least last I knew) - he pops in and out occasionally - and still does the trouble tickets I believe. @MeFlick thank you. I just hope the webinars never disappear from Vimeo. They are invaluable are are susanbluerobots videos. @Charo Wow, thanks for sharing, those are totally awesome! I get hooked on making things too, (I love 3D cards) there is just so much for me to learn still. I love all the different designs for the structures you used, I saw you said PNC, is that "print and cut" or the 3D software? If not print and cut, the papers you used are gorgeous, so creative! Sadly, I think a lot of people have dropped off because they bought the new machines, I know Diana (Di-Lite) has the new KNK Force along with quite a few of the other regulars, that uses SCAL so they may be into the FB groups that support those machines. I'm here for the long haul - I still have so much more to design and put up all be it in my Force Bazaar but they are all in MTC as well as separated out into svg so they are all accessible to you all. I love the camaraderie and the fun we have sorting out problems here. It keeps me thinking! @Charo, love your little houses. They don't have to be just for Christmas, think of all the sweet displays for other holidays. Wish I had the talent you and Di-lite and others have. Am in awe of all the nice projects you make. @Mary212 You are right about the houses having other uses than just Christmas. I have them scattered among books and shelves and just about everywhere and loving them still. The only "talent" these required was pixel tracing them in and then cleaning up the files. None of them came with instructions and some of them boggled my mind; still have two that I just cannot figure out. Di-lite is the Design Goddess in our world for sure. This image brings so much memory, I used to have some little houses when I was still young. They are simply amazing. @crazymags I guess a lot of us grew up with these little houses. 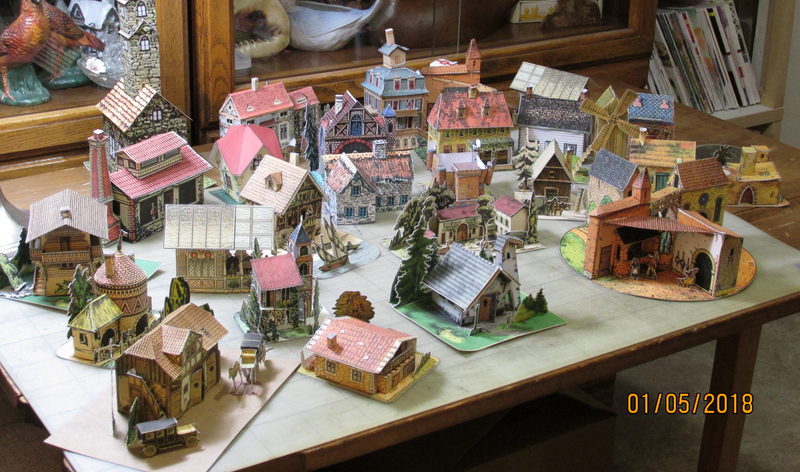 I thought I liked the old=fashioned putz houses but I like these more realistic little paper things better. Does make me feel like a kid again, running around the house arranging these little things lol. @Charo ... I LOVE your little houses!!! Each of these house files is a separate MTC file but if anyone sees a house or houses they would like just send me a message and I would be happy to email the file(s). Awesome job! Thanks for sharing your talent. I think it's your turn for a video!